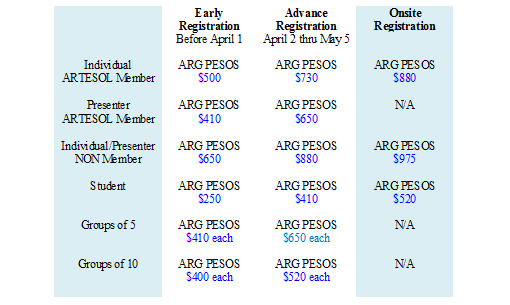 Registration fees include ARTESOL membership 2015.
International attendees are required to pay onsite. Hello, my name is Florencia Reyes González. I am a student of ELT at a profesorado in Chubut and I am interested in attending the conference. I have registered myself last week but I have not received any confirmation. It is possible that I have made a mistake. So, I wonder if it is possible to get some information about my registration and also about what type of fee I have to pay and how to pay it. Thank you very much for your help attention. We have received your pre-registration. You should have received an automated confirmation message. You will find instructions on how to submit your payment on top of the form. As regards the fee, you should register as a student. Please, feel free to contact us again.